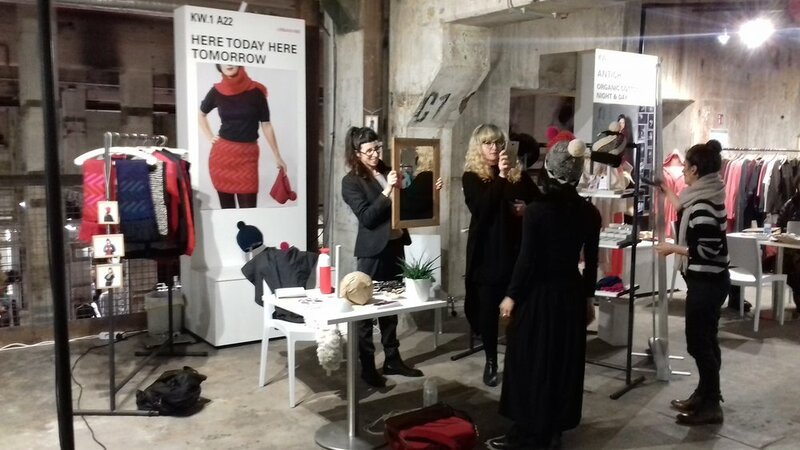 For us it has been so far so good, we have just been in Berlin to exhibit our AW18 knitwear collection and launched our jewellery collection at the Ethical Fashion Show Berlin (EFSB). Despite the weather being rather miserable, it did not have any influence on the splendid atmosphere in the cool venue of the old Kraftwerk (power station) building in the centre of Berlin, where the EFSB took place three days from the 16-18th of January. The atmosphere was warm and hearty with an overall positive vibe amongst buyers and traders. In this positive environment we made some great contacts, new friends met old friends and exchanged great ideas, received fabulous feedback and overall had a brilliant time. Working along side Arianna Nicoletti at our HTHT stand, we met many great people from the ethical and sustainable fashion scene in Germany. Arianna is one of the Co-founders at Aluc and now also one of the Co-founders for Green Fashion Tours (GFT) in Berlin, they organise great events, programs and tours all around ethical fashion. We met many other pioneers and wonderful people from all around the world. The EFSB is really the place to be to gain new insights, see development and meet forward thinking people, who are making progress, creating new systems, technologies, materials, changing policies in the fashion industry to create a more circular economy that is less harmful to the environment and people. The EFSB is a great place to get inspired by sustainable fashion brands and programmes from around the globe.